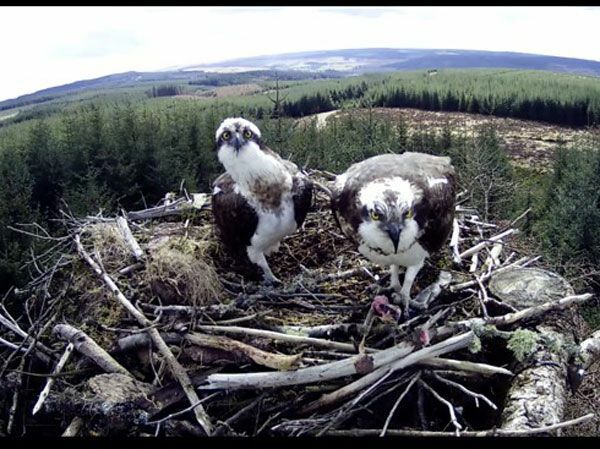 The bad weather afflicting Northumberland doesn’t appear to have affected the breeding chances of the ospreys nesting Kielder Water & Forest Park; all three pairs now looking after eggs. Despite the merciless onslaught of snow, hail, wind and rain over past few weeks, video footage on two of the nests (Nest 2& 3) have revealed both have a clutch of three eggs. This is particularly good news as one of these nests is playing host two a new pairing. Experts watching the ospreys are also confident that the other nest, occupied by an experienced pair, (currently without a camera) has a similar sized clutch. Last year, the ospreys had a successful season laying a total of 10 eggs and fledging six chicks. The success of this year will depend on how well the birds incubate the eggs during the current prolonged cold spell. At the moment, they appear to be sitting tight with minimal exposure of the eggs to the elements. Visitors can watch the antics of the birds on nest 2 through a nest camera broadcasting at Kielder Castle café and Northumbrian Water’s Leaplish Waterside Park.